Congratulations to My Chiropractor Hoover for winning Best Chiropractic Care Practice. Their commitment to their patients shows! 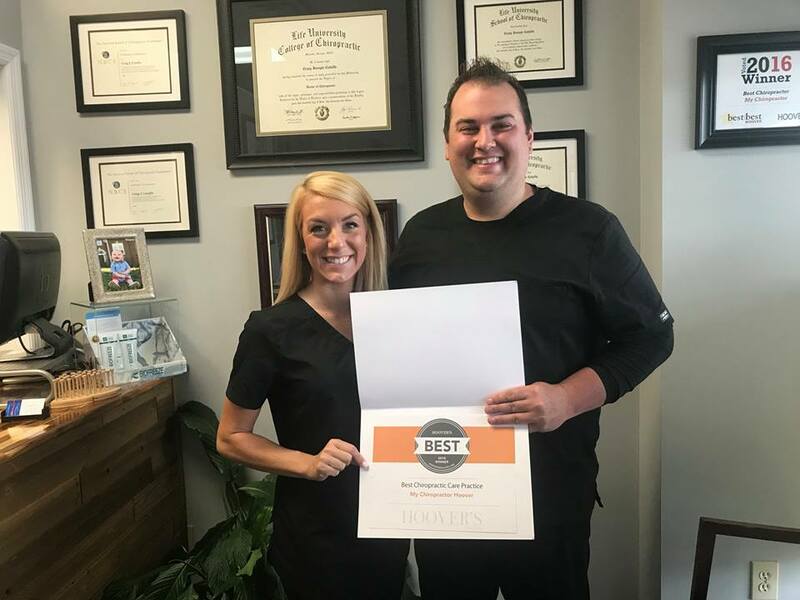 Thank you for visiting the website of Hoover Chiropractor Dr. Craig Catalfu and My Chiropractor - a professional Hoover chiropractic clinic located in Hoover Alabama, 35244. In practice as well as online, Dr. Catalfu's passion is to help those with minor ailments like sprains from activity, to debilitating conditions of arthritis, degenerative or bulging discs. Dr. Catalfu strives for excellence through superior patient treatment, education and satisfaction and he wont be satisfied until you are. Provide quality chiropractic care and physical therapy at a fair price. We exceed the expectations of our patients by providing outstanding care delivered by a dedicated team. Our patients know how dedicated we are to them, we know how quickly you want to regain your health and vitality, and keep it. We don't merely want to satisfy our patients; we seek to create patient enthusiasm and delight for life!. It means giving patients more than they expect. We know we're succeeding when we inspire our patients to go out and tell others about our practice. We are changing the way people think about "Health Care" by providing health care with a difference! Whether you're in Hoover, Birmingham, surrounding areas or online, our website will provide all types of health and wellness related information including information about our office and services, chiropractic, nutrition, back and neck pain, work and auto injuries and much, much more. chiropractic works wonders, don't wonder if it will work for you, call today 205 444 0727.